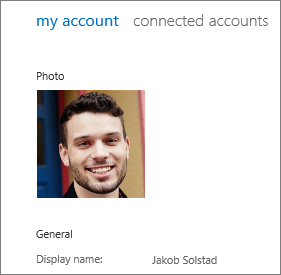 You can add or change your profile photo in Office 365 from Office.com, or while using Office 365 applications on your computer or in a browser on your phone. 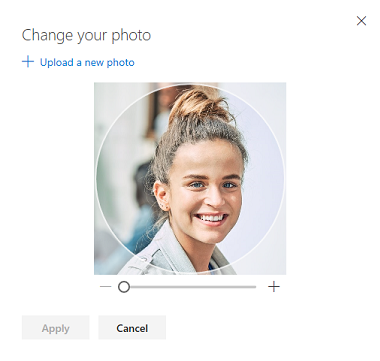 Your photo will appear everywhere there's a profile photo circle in Office 365. Find a photo you want to use and store it on your computer, OneDrive, or other location you can get to. The photo needs to be smaller than 4 MB and can be a .png, jpg, or .gif file. Sign in to Office 365 with your work or school account at office.com. Select the circle in the upper right hand corner of the page that shows your initials or an icon of a person. In the My accounts pane, select the circle that shows your initials or an icon of a person. Change your photo in the pop-up that appears. 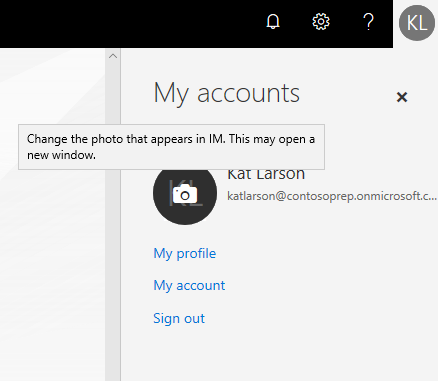 Note: If you or your IT administrator have already added a profile photo, it will appear in the circle. You can keep that photo, or follow the instructions to change it. 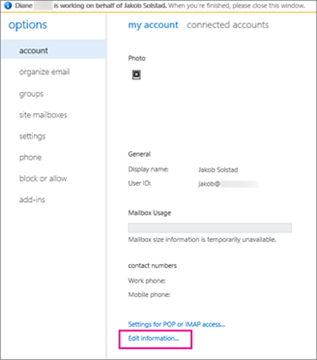 If you're an Office 365 admin, you can use the Exchange admin center or Windows PowerShell to add photos on behalf of users. 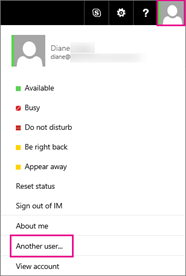 Go to the Office 365 admin center, and then open the Exchange admin center. Choose your own profile photo, and then choose Another user. Select the user you want to update, and then choose OK. Under Account, choose Edit information. Browse to the photo you want to upload, select it, and then choose Save.